petition: Miyako has lived 44 years alone trapped in a concrete prison. Help her before it is too late! Miyako has lived 44 years alone trapped in a concrete prison. Help her before it is too late! When she was just a 6-month-old baby, Miyako the elephant was taken from her family in Thailand and brought to the cruel conditions at the Utsunomiya Zoo in Japan. For 44 years, she has been forced since to live alone. Deprived of any comfort or companionship in her stark environment, Miyako attempts to interact with zoo visitors. 44 years is a staggering 16,000 days. Day in and day out, hour by hour she is left there, just walking around that tiny empty space with absolutely nothing to do, biting on a steel bar, trying to engage with anything...anyone. It's an unimaginable thing to do to an animal that is naturally highly intelligent and social. Elephants can live up to 70 years, and are exceptionally social animals who have families and friends. They grieve their dead and have strong bonds with their babies. But finally her plight has come to light! it's not too late for Miyako to get a chance at a better life. The Elephants in Japan Campaign is working with top elephant experts and organizations to help Miyako and other solitary elephants in Japan. But we need your help! Please sign and share this petition demanding change for Miyako! The more voices we can add to this cause, the more power we have to approach our targets and demand change. For Miyako, change would mean things like a much better, enriched living environment and opportunities for her to interact with other elephants. She should not be forced to live out the rest of her life like a forgotten, thrown away toy! For other solitary elephants and captive elephants in Japan, this would mean pushing for the government and other relevant authorities to develop zoo legislation in Japan that requires all zoos to be licensed and that sets standards of housing and care, including prohibiting the keeping of highly social animals, like elephants, in social isolation. Thank you for your help to save Miyako! Earlier this month, we sent Miyako's zoo a letter with your signatures (by mail & email). There has been no response. So now, we need your help. Let's show the zoo we are serious in our fight for Miyako, who has been living TOTALLY ALONE in awful conditions - FOR 45 YEARS since she was just a baby! Please write a letter to Miyako's zoo demanding change! BY MAIL TO: Utsunomiya Zoo, 552-2 Kamikanaimachi, Utsunomiya, Tochigi Prefecture, Japan 321-2115 BY EMAIL: info@utsunomiya-zoo.com THANK YOU! 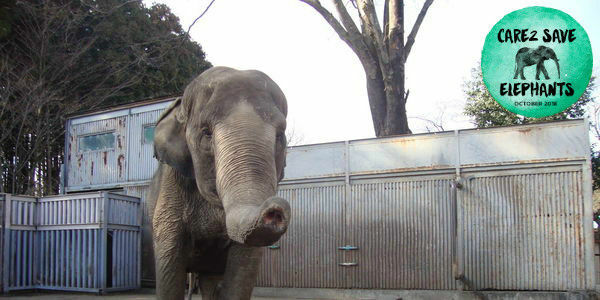 For 44 years, Miyako the elephant has lived totally alone at an outdated, abysmal Japanese zoo. UPDATE: Thanks to your signatures + shares, Elephants in Japan & Zoocheck were able to deliver a big box containing a whopping 240,000+ signatures to local targets! We are now communicating with them to find out more about the local animal welfare laws and who has authority in the situation. We will keep you posted along the way and let you know how you can help, as next steps come to light! Thank u!